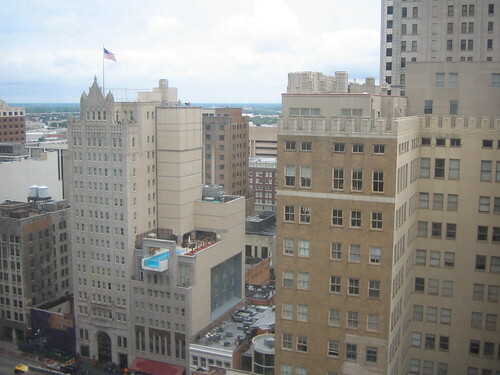 The Joule Hotel at Dallas, USA has an incredible swimming pool at its 10th floor which cantilevers 8 feet (~2.4 metres) beyond the hotel wall. The pool's deep end has a solid glass wall providing swimmers not only with the sensation of swimming off the building's edge but also a dazzling view of downtown Dallas. The pool has maximum water depth of atleast 4.5 feet (~1.37 metres). The pool precariously perched over the sidewalk, looks like a huge fish tank and at the time of its commissioning in 2007, it had reportedly caused some traffic jam, with the passers-by ogling at the swimmers at the edge.